Without the hope of reward, humanity has little to no incentive for self-improvement. That is why I am an Anti-Socialist. 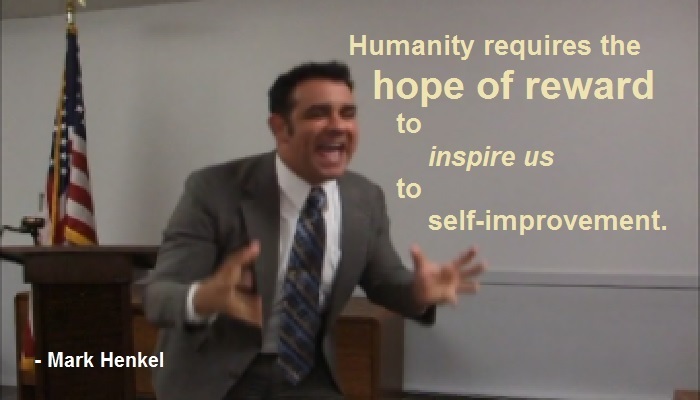 “Humanity requires the hope of reward to inspire us to self-improvement. “ I make this important soundbite in my speech, The Anti-Socialist. In the speech, I use an example of the legendary Michael Jordan to demonstrate the process by which he became the famous superstar basketball player. When he was younger, he had the hope of reward. So he practiced, got better (self-improvement), and with victory, he got his first reward. He then parlayed that, had a new hope of reward, practiced, got even better, achieved even greater victories, and earned even better rewards. With each new reward, Michael Jordan would subsequently have new and larger hope of rewards, which inspired him to work even that much harder to become even that much better – for ever greater and greater rewards. He reached the pinnacle of superstardom in basketball, inspired by the hope of rewards. This is a fundamental lesson for all of us. The hope of reward can inspire us to work harder to self-improvement. Thereby, we can achieve amazing things. Truly, we human beings can be amazing when we are inspired! But socialism puts a proverbial “wet blanket” to douse the “fire” of inspiration. More directly put, socialism is a hope-killer. As it seeks to equalize outcomes, socialism utterly removes the essential hope of reward. When everyone is “equal” in outcomes, there is no hope of reward. And without that hope, there is no inspiration, incentive, or even reason for anyone to try to self-improve. Absolutely, humanity fundamentally needs the hope of reward. That is why I am an Anti-Socialist. As part of the project to provide tools of shareable memes to polygamy activists, the pic for this sound-bite has been posted on Pinterest. Pinterest PIC: Humanity requires the hope of reward to inspire us to self-improvement.